I realize that I've been sharing a lot of Elisha's posts lately. She just puts things into words in a way that I cannot seem to do. This is so beautifully written that I feel like I shouldn’t add any of my own comments. Although these words make me ache inside, it’s a good reminder to me that I’m not alone. We all need that reminder from time to time. Usually more often than not. Do you remember the excitement you had when telling your husband, best friend, sister, or parents that you were expecting? Do you remember how pregnancy changed your body–it was just a little at first, but then as your baby grew, so did your belly and you rejoiced with each belly rub, or picture taken to show the progression? Do you remember the emotions you felt when your miracle kicked for the first time? Or had the hiccups? What about when your baby would move inside of you at the sound of your voice? How about the overwhelming sense of joy you felt when you gazed into their eyes for the first time and counted their fingers and toes? Now try to strip yourself away and imagine never having those memories or experiencing those climatic moments. Take a moment to close your eyes and place your hand over your womb while imagining the pain of hearing a doctor tell you that the chances of conceiving are less than 3 percent, you do not mature eggs for ovulation, your husband has zero sperm, or your pregnancy is no longer viable and you will miscarry. Imagine yourself in your second or third trimester going in for a routine doctor’s appointment expecting to hear the nurse tell you that there is a healthy baby developing perfectly, but the only thing you hear is the silence followed by a muffled voice telling you there is no longer a heartbeat. Imagine instead of picking out your child’s first outfit, you choose a casket. Try to imagine the pain associated with never knowing what it will feel like to have your child’s arms wrapped around your neck and you’ll never get to hear the sound of their voice or look into their eyes. Better yet, your beloved infant will never get to look into your eyes and see the love you have for them. No one wants to imagine these moments or feel this type of pain for even a second, but for some women, it is their reality. It is their reality that often paralyzes them with worry as they fear of never being able to experience motherhood. It is their reality that keeps them set apart and always on the outside looking in while attending social gatherings. It is their reality that makes being able to get out of bed and attend a church service on the second Sunday in May an unbearable and tearful struggle. The second the alarm goes off and their eyes open they begin to feel a queasiness in their stomach, a heaviness in their chest, and a lump in their throat as they try to pull themselves out of bed and put on their Sunday best. The fears, worries, and painful emotions are magnified and intensified as many women who are struggling with infertility attend a Mother’s Day church service. For those who have suffered a miscarriage, still birth or experienced an unsuccessful adoption, watching the baby dedication is like pouring salt into their wound and as each mother stands to be recognized and receive their gifts, shame covers those who are forced to be left sitting, unqualified for such honor. Even for those who are strong in their faith, this day is not easy and I know many who will intentionally avoid getting out of bed and going all together. But it shouldn’t be this way. These women should feel invited and be able to run to the church on this day for prayer, peace, comfort, and hope instead of crawling underneath the covers and feeling left behind. 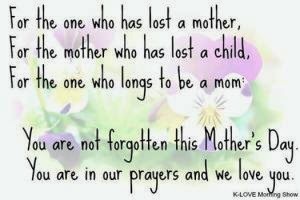 Therefore as your church celebrates Mother’s Day this year, I encourage you to please take the time to also remember and give special attention to those who are still waiting for their miracle, or who have experienced a loss through a failed adoption, miscarriage, or still birth. For instance, if during your Mother’s Day service you normally ask mother’s to stand while others remain seated, secretly lowering their heads, I encourage you to instead expand to appreciate the contributions of all women because it extends to teachers, pastors, neighbors, aunts, sisters, Godparents, foster parents, or anyone who has loved with a mother’s heart. If you are a church leader, I encourage you to openly pray for them, encourage them, and ultimately remind them of the hope they have in Jesus. This Mother’s Day, I encourage the church to celebrate the Proverbs 31 woman and give her the love and attention she deserves, but in the process, please don’t forget the 1 Samuel 1 woman who is quietly sitting in the back, wiping away her tears. And then my heart skips a beat.